Another recipe that I had recently pinned on Pinterest was for a complex-looking eggplant caponata. I love caponata; eaten cold on crackers, it makes for a light summertime lunch. Add some read wine, and it's a nice little dinner. Leftovers are pretty good stirred into hot pasta or layered into a veggie lasagna. There's just so much going on in this version...a little tartness from vinegar & lemon juice, a little heat from red pepper flakes & garlic, a little sweet from raisins & sugar, a little salty from olives & capers, a little depth from fried eggplant & unsweetened chocolate. The key to this recipe is to follow all of the cooking times. If it says to cook each step for 10 minutes, please do so...it's essential for developing the flavors. Heat oil in a 12-inch skillet over medium-high heat. Working in batches, add eggplant and fry, tossing occasionally, until browned, 3–4 minutes. Using a slotted spoon, transfer eggplant to a large bowl; set aside. Pour off all but 1/4 cup oil and reserve for another use. Return skillet to heat, add onions, celery & garlic and season with salt & pepper; cook, stirring often, until beginning to brown, 10 minutes. Reduce heat to medium and add tomato paste and cook, stirring, until caramelized and almost evaporated, 1–2 minutes. Add crushed tomatoes, red pepper flakes & oregano and continue cooking for 10 minutes. Stir in olives, vinegar, lemon juice, raisins, capers, chocolate & sugar and cook, stirring occasionally, until thickened, about 15 minutes. 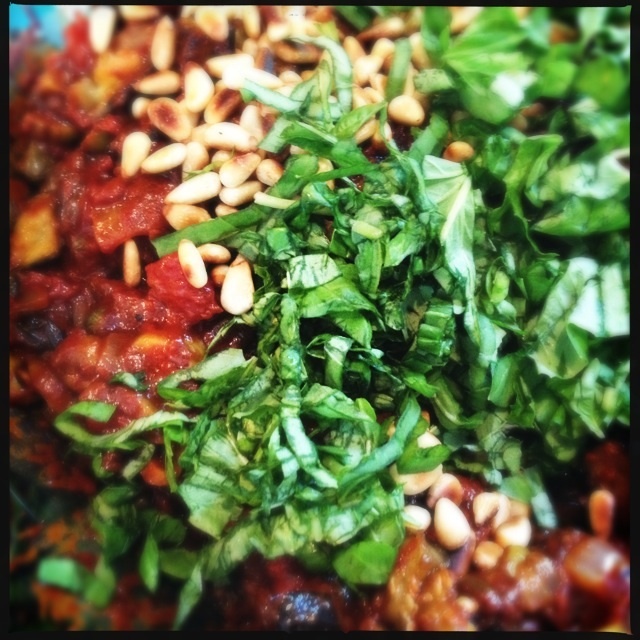 Transfer to bowl with eggplant, add basil & pine nuts, and mix together. Season with salt & pepper.